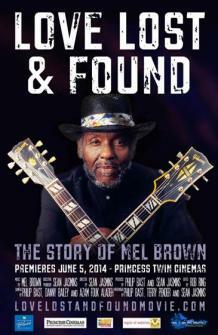 Love, Lost and Found: The Story of Mel Brown - Movie Premiere presented by the TD Kitchener Blues Festival, Princess Cinemas (Waterloo Regions year round film festival) and the Grand River Film Festival will be at Princess Cinema Twin in Waterloo, ON on Thursday, June 5, 2014. The doors open at 6:30PM, and the film will be screened starting at 7:15PM. The Movie Premiere line-up includes Love Lost & Found - The Story of Mel Brown film plus a special performance by Juno Award winner Julian Fauth at 6:30pm in the Cinema lobby before the 7:15pm film showing. "Man, you play some good guitar"
"Mel Brown...those are shoes that will never be filled, I learned so much from him"
"Mel Brown was funky, primeval and perfect"
"Mel Brown is dangerously intense and so good it almost isn't fair"